Downtown Huntsville - A webcam in Huntsville, Alabama with image archive and current weather data. Huntsville, Alabama: WAAY-TV, 3.4 mi. Madison, Alabama: Intergraph Corporation, 9.6 mi. Fayetteville, Tennessee: Belle Oaks Subdivision, 21 mi. Guntersville, Alabama: Wyndham Garden Lake Guntersville, 31.1 mi. Oneonta, Alabama: Blount County Courthouse, 53.9 mi. Gadsden, Alabama: Gadsden City Hall, 59.6 mi. Bell Buckle, Tennessee: Webb School, 61.4 mi. Tuscumbia, Alabama: Alabama Music Hall of Fame, 63.4 mi. 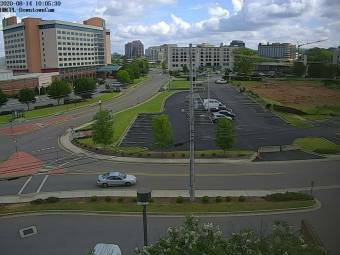 This webcam Huntsville, Alabama with the theme City Views was added on November 20, 2015 and is operated by HMCPLITS@wunderground. It got 643 visitors since then. Shouldn't this webcam work or should the link be wrong please report that here. You can add this webcam here to myCams.